Capt. 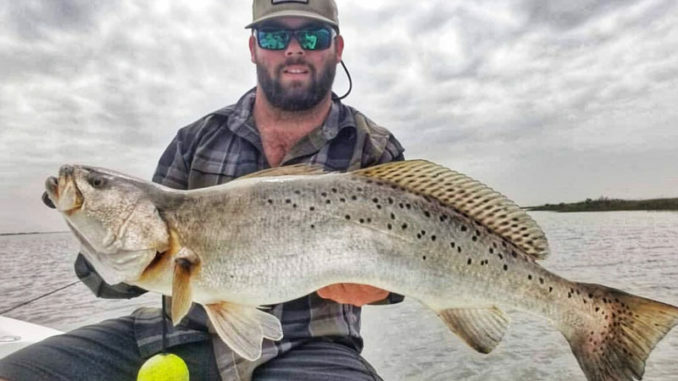 Brian Windsor of Hackberry caught this 7 ½-pound speckled trout on a bone-colored Heddon One Knocker Spook topwater lure on March 14. While fishing in West Cove on March 14, Capt. 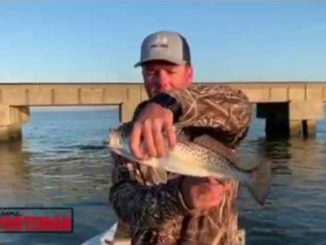 Brian Windsor of Hackberry caught a 7 ½-pound speckled trout on a bone-colored Heddon One Knocker Spook topwater lure. And the fish, said Windsor, wasn’t even fat. “It was as skinny a fish as I’ve ever seen. The belly was completely empty. It would have weighed a heap more otherwise,” he said. But Windsor isn’t complaining. The 27 ½-inch fish is the kind of trout he likes to see this time of year. “This time of year, from March through May, is usually when we see our biggest trout caught. We will see some good ones between 6, 7, 8, and 9 pounds, and this one ranks right up there with them,” he said. 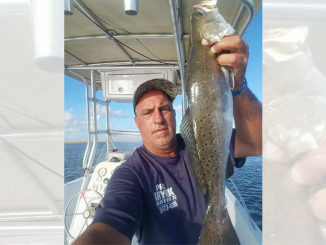 Windsor , who owns Tidal Charters LLC (337-884-9748) was fishing at high tide around 1:30 p.m. when he caught the big speck, which he said was chasing baitfish on the flats when he made a cast. And as he worked the lure in, the fish couldn’t resist it. “I prefer fishing when the tide is moving up to high, but really as long as the tide is moving at all, it’s a good time for trout fishing. These fish definitely bite better when there is some tidal movement. 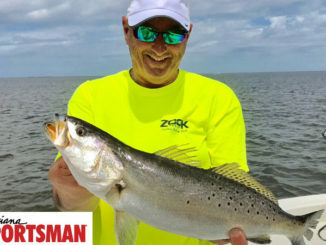 But even when it’s all the way high, they are going to be on those flats chasing after baitfish and that’s what this fish was doing when it bit,” he said. Along with this big fish, Windsor said the trout bite has been hot, and he expects it to continue to heat up even more as the spring weather stabilizes. This time of year, he likes to wade, drift, or do a combination of both while putting his clients on trout, redfish and flounder.